CefSharp is the the easiest way to embed a full-featured standards-complaint web browser into your C# or VB.NET app. 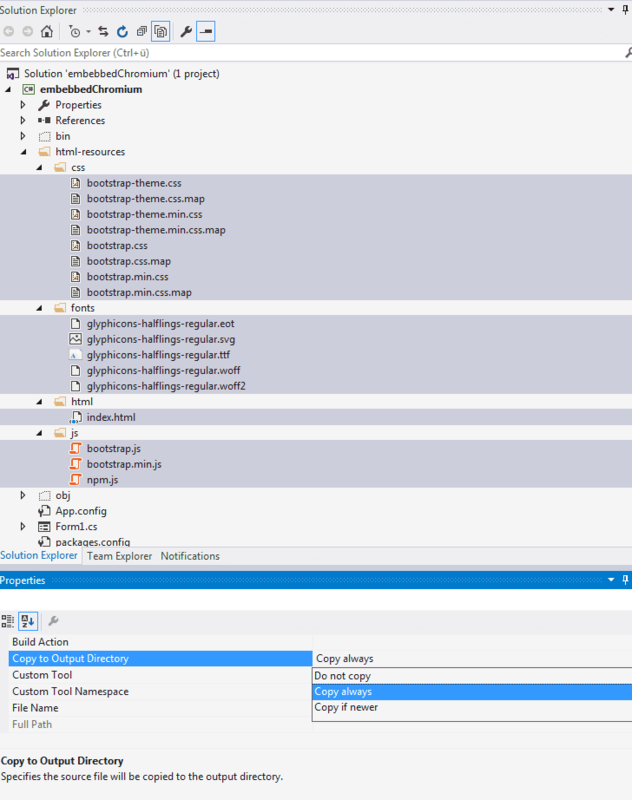 CefSharp has browser controls for WinForms and WPF apps, and a headless (offscreen) version for automation projects too. 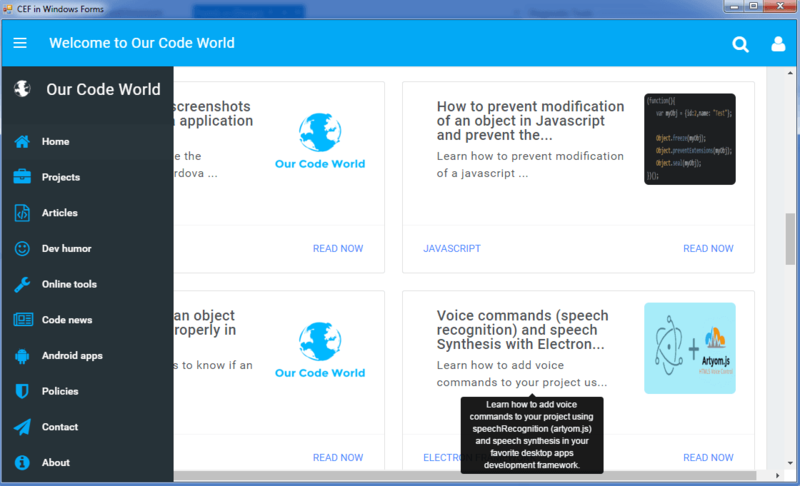 CefSharp is based on Chromium Embedded Framework, the open source version of Google Chrome. You can get more information about the CefSharp project in the official homepage here. You can use CefSharp either as a Browser component instead of depend of the version of internet explorer that your user has installed on windows or as a predefined user interface of your app. Yes, you can use HTML controls (buttons, inputs) in your winforms c# application and customize with CSS as you want (Bootstrap, etc). 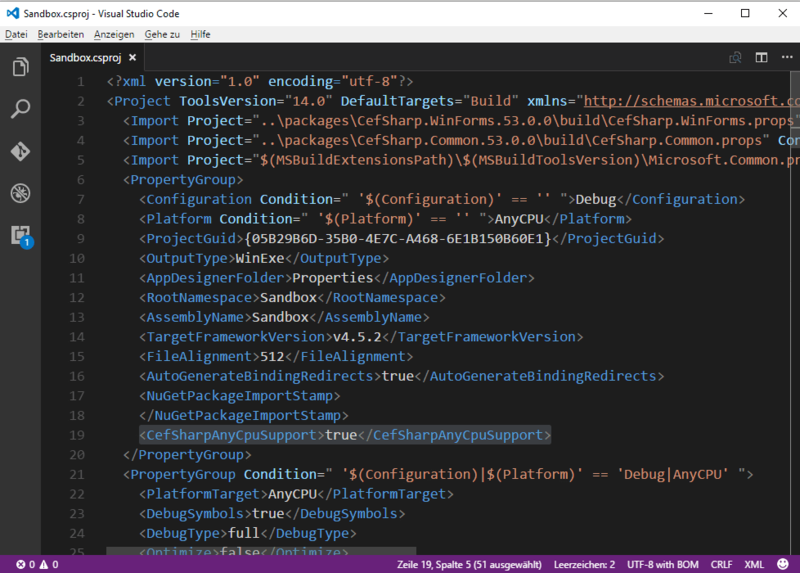 In this article we'll work with CefSharp version 49.0, if you want to use CefSharp version +51 we'll provide some tips that you need to know with the new version. 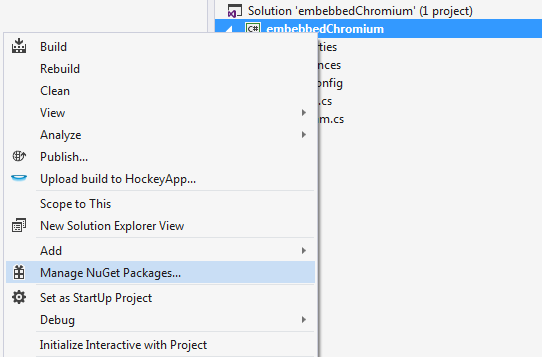 Visual Studio with NuGet Package Manager (>=2010). CefSharp 45.0 and later requires VC 2013 Redistributable Package x86 be installed. Earlier versions require VC 2012 Redistributable Package x86. An unhandled exception of type 'System.IO.FileNotFoundException' occurred in browser.exe Additional information: Could not load file or assembly 'CefSharp.Core.dll' or one of its dependencies. Now after the creation, add CefSharp. 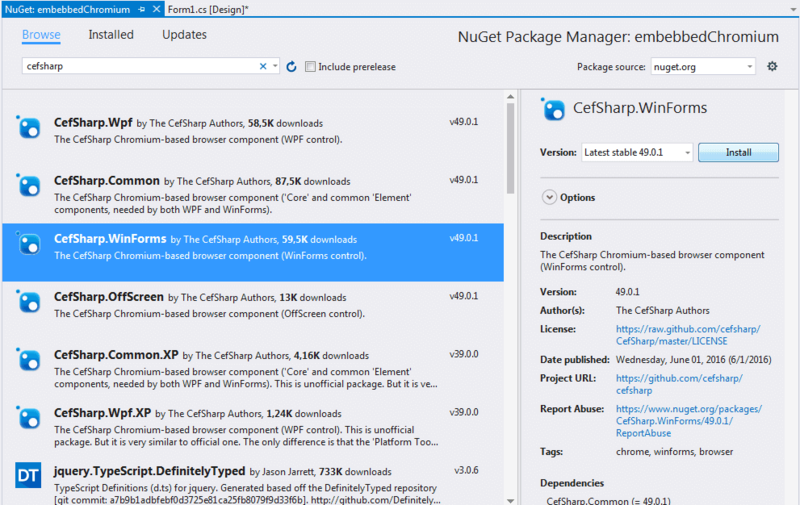 To add CefSharp, go to the Solution Explorer on the Top Right of Visual Studio, then right click on your app (under the solution) and select Manage NuGet Packages. When the search menu appears, type cefsharp , select the WinForms distributtion and install it. Everybody loves succesfully messages, do you ? I do ! If you need more help or you can't modify those files, then take a look to the issue about AnyCPU in Github here for more help. 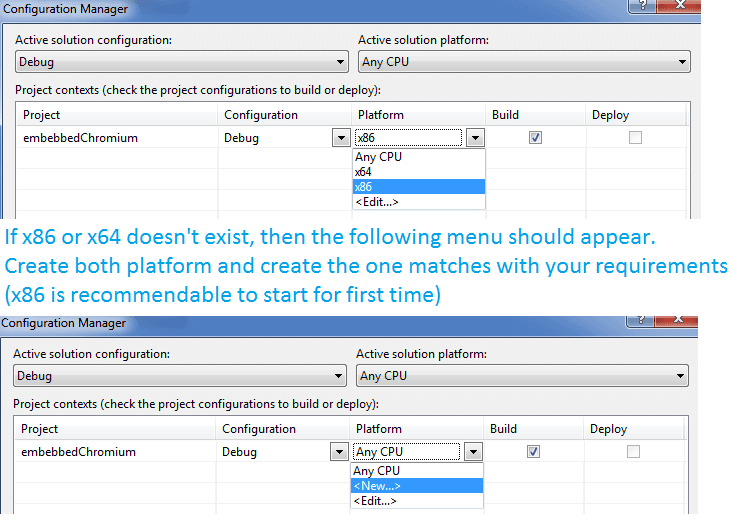 With CefSharp 49 or older versions, you'll need to provide the architecture of your project or CefSharp won't work. Proceed to change the configuration of your project with the configuration manager. As boromir said, the target platform of your project can't be anyCPU, it must be either x86 or x64, otherwise you'll get the following warning in your console and your app will not compile. 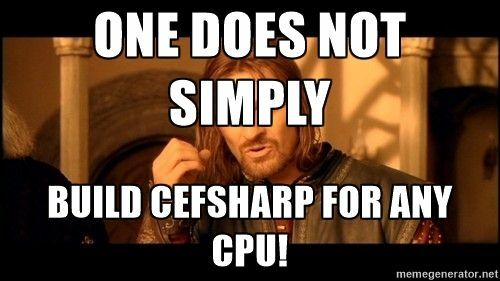 CefSharp.Common does not work correctly on AnyCPU platform. You need to specify platform (x86 / x64). Note that you need to create the x86 or x64 if they don't exist selection <New...> option, adding it and then selecting it. 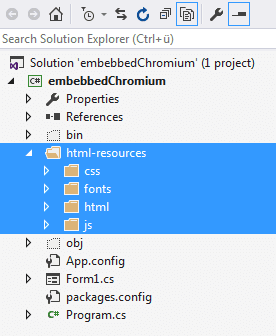 After the basic configuration of CefSharp in your project, the project will build successfully as we have all that we need to use chromium. Now we need just to append to our form and use it with code. // Add it to the form and fill it to the form window. Now start your app (F5) or click on start in the toolbar, and you'll see how Our Code World is loaded in your C# Winforms Application. Congratulations ! You've just implemented CefSharp in your application at its most basic expression. We recommend you to keep reading the documentation of the framework and see how can you create more awesome things. We need to include our HTML Assets in our Visual Studio Project. You can create them directly either from visual studio or the windows explorer, but via visual studio is easier as the folder is automatically added to the project resources. Select all html,js,css resources inside the folder. In the bottom set the Copy to Output Directory value to Copy Always. Note that you need to provide a full local path to your files always. As a normal project needs to be able to work everywhere, therefore the path is relative to the executable of our project. Allow the use of local files (file://). // Note that if you get an error or a white screen, you may be doing something wrong ! We use the File.Exists method to see if the providen path exists, otherwise you did something wrong on the previous steps. Be careful if your project is in a different hard drive than the main disk as in development other path rather than (C://) is most likely to fail. Remember to respect the "camelCase", the method in C# needs to start with lowerCase and obey the camelCase rule (no underscore _ ), as shown in the class. Now start your app and enjoy HTML controls as graphical user interface in windows !